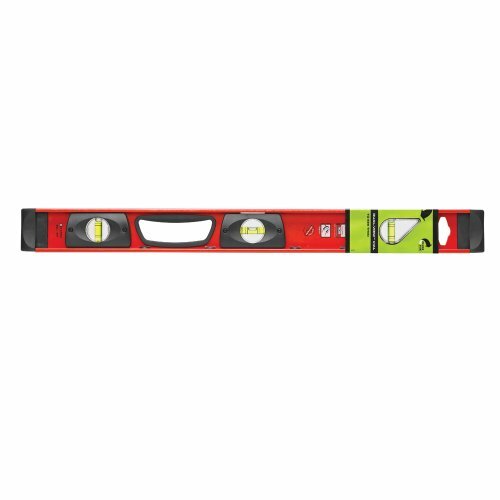 The Kapro 170 series I-beam spirit level has one level, one plumb, and one 45° vial for determining horizontal and vertical plane as well as incline with a sensitivity of 1 mm/m (0.001"/inch). The vials are made of injection-molded acrylic to resist breakage, and the level vial and the plumb vial with top-view sight (Dual-View Plumb Site) can be read from the side and the top. Rubber end caps help absorb impacts. The level has an aluminum frame for light weight and corrosion resistance, milled leveling surfaces for accuracy, and a handgrip for portability and ease of use. It is available in 24" and 48" lengths. Levels are used in the building trades, engineering, surveying, and metalworking, among other applications. Levels are instruments that are used to determine the true horizontal or vertical plane of a surface. The most common type of level is the spirit level, or bubble level. Spirit levels have a liquid-filled, bowed tube (also called a vial) with a bubble that moves when slight adjustments are made to the level. When the bubble settles between marked points on the vial, it indicates that a surface is horizontally or vertically straight. Levels can have one or more vials to determine the horizontal plane, the vertical plane, or various points between, such as a 45-degree angle, simultaneously. Some levels include a laser line indicator that projects a horizontal or vertical beam on a surface. Bullseye levels, or surface levels, are circular, flat-bottomed spirit levels that determine whether a surface plane is level. Machinists’ levels are made of metal and have surfaces designed specifically for rugged use in a machine shop or tool room. Levels can range from highly-complex and accurate machines, such as those used in the surveying and construction industry, to precision instruments used in carpentry and other building trades, to simple, pocket-sized devices for do-it-yourself projects. Kapro manufactures spirit levels, laser levels, layout tools, and measuring tools. The company, founded in Israel in 1974, meets International Organization of Standardization (ISO) standards 9001, 14001, and SA8000. If you have any questions about this product by Kapro, contact us by completing and submitting the form below. If you are looking for a specif part number, please include it with your message.